Annie Close and I are hosting an Open Morning for people who have had a Cancer diagnosis, on Friday 1st and Wednesday 6th March 2019 between 10 and 12pm. 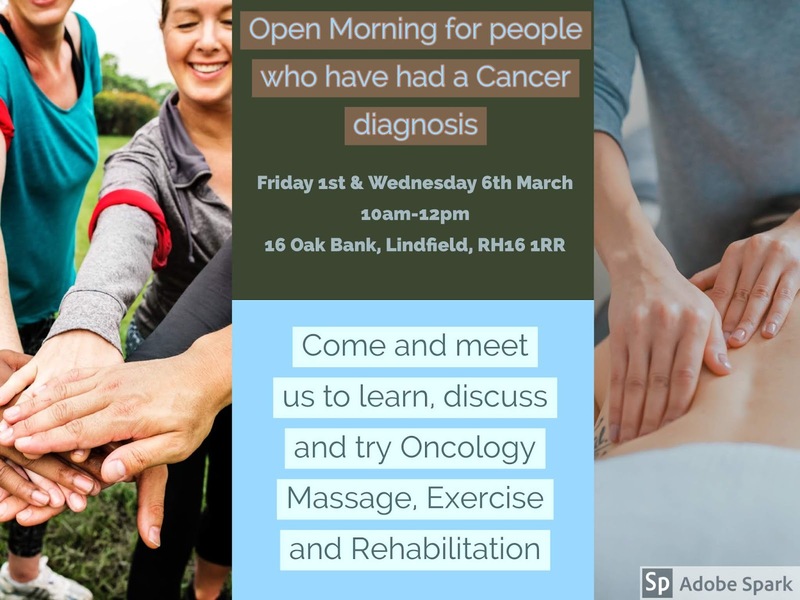 Annie is an experienced Personal Trainer and a qualified Exercise for Cancer Rehab trainer and I hold an Oncology Massage qualification. Learn why Massage can help relieve the symptoms of cancer or side effects of treatments? Discuss why movement and exercise is beneficial to help reduce the symptoms of cancer and the side effects of treatment. **25% discount ** for treatments and programmes booked on the day.